Does a vagrant-fighting "bum bot" give robots a bad name? An engineer builds a water cannon-toting machine to keep loiterers away from his bar. Terrill Rufus poses with his vagrant-fighting Bum Bot. Rufus Terrill, a 57-year-old ex-Marine bar owner and engineer in Atlanta, says that vagrants are destroying his neighborhood. "They're out here to get money for drugs, to get money from breaking into cars," Terrill recently told the Associated Press. "These are bad guys." Terrill says he's tried many ways to keep such bad guys off the streets. First he patrolled the area on foot with an assault rifle in hand -- that didn't fly with police. Next he started shooing people away with a spotlight, but some rascally locals flashed their own guns in response. Then Terrill's wife suggested a novel idea: Why not build a robot to fight loiterers? After all, robots now defuse bombs, clean carpets, and take care of senior citizens. Surely a bot could help keep drug users away. Enter the Bum Bot. That's what Terrill calls the vagrant-fighting robot he built last fall -- a man-high structure of steel and plywood covered in black rubber gym mats, the thing looks like a special effect-shop reject, but it's also scary as all get-out. 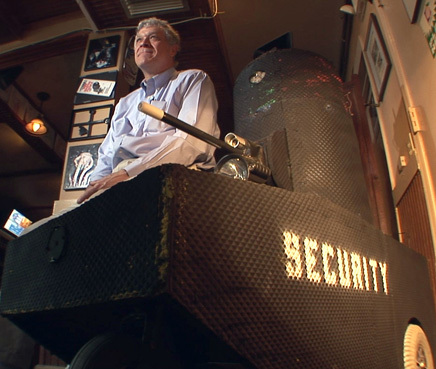 The Bum Bot, which is powered by four car batteries and trucks about on a three-wheel scooter, is outfitted with a spotlight to frighten people away, an infrared camera that beams back live video images, a loudspeaker through which Terrill can address alleged ne'er-do-wells, and a turret-mounted water cannon that can attack at a moment's notice. Using a remote control, Terrill commands the bot to roam nearby streets -- when he sees people he thinks ain't welcome 'round these parts, he warns them away with the loudspeaker, and if they're obstinate, he may unleash other weapons in the bot's arsenal. Homeless advocates are up in arms, justifiably; neither Terrill nor his vigilante bot have any legal jurisdiction over his streets, and surely we don't want to live in a world in which engineers are free to build their own bot-weapons to unleash upon the citizenry. Some suspect ulterior motives, too -- Terrill intends to run for mayor, and the bot, many say, is a way to drum up publicity for the campaign. Terrill doesn't exactly deny this either: "He'll be my chief of staff. He'll be parked in front of my office," Terrill says of the Bum Bot. But buried in this municipal fracas is an interesting tech story: Is the Bum Bot giving robots a bad name? Henrik Christensen, director of Georgia Tech's Robotics and Intelligent Machines Center, tells the AP that he worries about precisely this outcome: "We have a Hollywood picture that [robots are] going to run amok, kill people and do bad things. This Bum Bot plays on that stereotype ... For the rest of us who want to use technology to assist people in their daily lives, it's an obstacle." Christensen has a legitimate worry. In movies and on TV, robots don't get much love. Sure, you sometimes see lovable bots or androids (there's "Star Trek"'s Data, or that bot from "Short Circuit"), but the media image of robots has long been negative: In the "Terminator" movies, robots come from the future to kill us. In "RoboCop," the bot is nominally good, but he sure isn't cuddly. The Bum Bot works in that tradition. It scares people because it appears big and strong and inhuman. So, sure, it's not doing robots any favors. But I'd argue that Christensen is missing a recent uptick in robot appreciation. For instance, search for "Roomba" on any video-sharing site and you'll witness vivid, cloying demonstrations of human-robot love. And notice the reaction to last year's General Motors Super Bowl commercial featuring an assembly-line robot jumping off a bridge (after it was fired from a GM plant for dropping a screw) -- suicide prevention groups feared that the robot's suicide attempt would prompt people to kill themselves, and GM decided to edit the ad. Isn't that remarkable? We now think so highly of robots that we consider them possible models for human behavior -- surely that indicates that we've moved beyond thinking of bots as mindless killing machines, no? The robotics professor, I think, underestimates the capacity of good robots to overcome the sins of evil ones. Sure, we'll see robots doing unseemly things now and then, just like we see humans slip all the time. But when you witness the Bum Bot kicking a poor fellow off the street, you're not soured on robots in general. You know the robot's just doing what he was programmed to do -- and that other bots, better bots, will be there for us when we need them.